Mikael Helasvuo is known as a leading flautist in Finland, and internationally renowned for his wide-ranging mastery of his instrument. 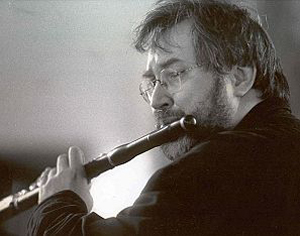 Mikael Helasvuo studied the flute at the Sibelius Academy under Juho Alvas, and later abroad at the the Prague Conservatory with František Cech and at the Freiburg Music Academy with Aurèle Nicolet. He has supplemented his studies in master classes with Jean-Pierre Rampal, Severino Gazzelloni, Samuel Baron and Pierre Séchet. He launched his career in 1973 with the Helsinki Philharmonic Orchestra, and in 1976 was appointed the flute soloist of the Finnish Radio Symphony orchestra until 1988. Today, Mikael Helasvuo is in great demand as a soloist and chamber musician. He has performed in most European countries, the United States, South America and Japan. He regularly gives concerts featuring an ever-changing contemporary repertoire, as well as Baroque and Classical works performed on period instruments. He often performs with pianist Tuija Hakkila or guitarist Jukka Savijoki as a partner. Many of his recordings have won top prizes both in Finland and abroad. He has given world première performances, as well as the first Finnish performances of over two hundred flute compositions, in recognition of which he received the Madetoja Prize from the Finnish Composers' Association in 1992. Helasvuo is currently Professor of Wind Instruments at the Sibelius Academy in Helsinki. He has given numerous master classes in Germany, Sweden, Norway and other countries. Since 2001 he has been the Artistic Director of the Early Music Festival in Hämeenlinna, Finland.